Product information "REFURBISHED - Breeze 4K Set with Controller and car charger (EU Version)"
Refurbished item. Quality checked and full functional. Original packaging. May have signs of use or storage. The packaging can be damaged. Is your selfie stick too short? Does your action cam lack perspective? Introducing Breeze, which will allow you to have your flying camera with you at all times. 24 cm in diameter and weighing just 385 g, you can discreetly store your small selfie drone in almost every bag. Really practical: Your smartphone serves as the controller with live image transmission. The integrated and pivotable 4K UHD camera captures strikingly sharp selfies, aerial photos and snapshots. To save even more space, simply fold up the rotors. You can safely transport the Breeze in the carrying case, which is included in delivery. Thanks to GPS and IPS (indoor positioning system) the Breeze can hold its position both indoors and outdoors. If you let go of the joystick, the Breeze will stay in the air until you take the control again. By the way, this also works if someone calls you or interrupts the connection while flying. You’ll be repeatedly warned before battery power is down to 5 % so that the return-to-home feature doesn’t activate an automatic landing. You can activate the return-to-home feature at any time while flying. Use the Breeze Cam app to manually fly the drone, use automated flight modes and edit photos. You can carry out all major camera and flight settings via the menu of the app. You can also choose between the different flight modes, set maximum altitudes and distances, set the photo resolution and video resolution, install firmware updates, edit images, and much more. Record the best moments of your life and share them with friends straight away, directly using the Breeze Cam app via social media (Facebook, Twitter, Instagram, YouTube and many more). During flights, the live image of the Breeze camera appears in 720p or 480p on the screen of your mobile device (depending on the video resolution setting). 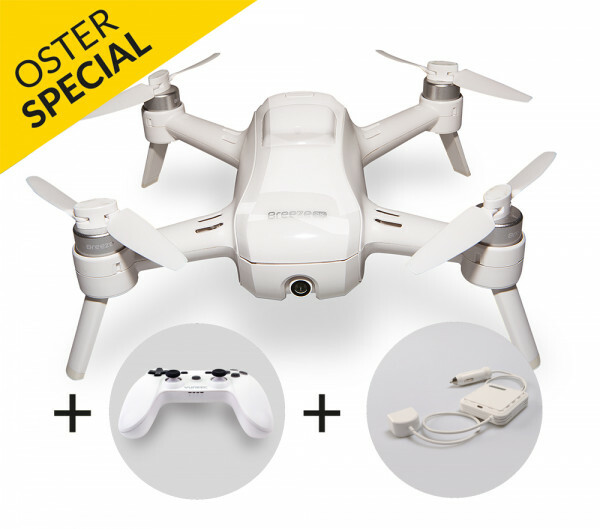 That way, you’ll never again miss the perfect opportunity to take great aerial shots and footage. The Breeze drone comes with a rechargeable battery, controller, car charger, transport box, spare rotor blades, rotor protection guards for indoor flights and additional accessories. Related Links "REFURBISHED - Breeze 4K Set with Controller and car charger (EU Version)"